Clarity on how many companies eventually will switch to a private exchange remains elusive. The growth of interest in private health-benefits exchanges may be flattening out, judging by data from the Private Exchange Evaluation Collaborative (PEEC), an initiative of four regional corporate health-care coalitions and PricewaterhouseCoopers. In a recent survey of 446 employers of all sizes, 47% said they have either implemented a private exchange for full-time, active employees (6%) or plan to consider doing so before 2018 (41%). That result was essentially flat from a year ago, when 45% said one or the other. Still, Barbara Gniewek, a PwC principal, characterizes the finding as positive for the private-exchange market. Some observers had believed interest in the Internet-based, benefits-purchase portals was actually declining, she says, as a number of large employers that evaluated private exchanges for 2015 decided not to pull the trigger. But that doesn’t necessarily mean those employers are out of the game for good. Many “realized that the market was more complex than they thought, and it’s going to take longer to evaluate,” Gniewek says. That was especially so, she adds, for large employers that got proposals from the big benefits consulting firms — Aon Hewitt, Buck Consultants, Mercer and Towers Watson — that are offering private exchanges. While those four firms have garnered most of the spotlight, there are more than 100 companies now offering private exchanges for active employees, including insurance brokers, carriers and benefits-technology vendors, according to Gniewek. Companies may be exercising greater care before going with one of the consulting firms if they’re already customers of other services that the firms offer. In the survey, 72% of respondents said it was “very important” that their benefits adviser be independent of any exchange they’re considering, while only 6% were not worried about that (22% said they were unsure). In fact, the PEEC was founded to be a source of nonbiased information about the private-exchange market. It should be noted, though, that while PwC does not have a product in the market, it does compete in other ways with the consulting firms that do. Upon the PEEC’s formation, a key intention was to evaluate whether private exchanges help companies save money on health benefits, as the products’ vendors claimed. Early results suggest that they do. 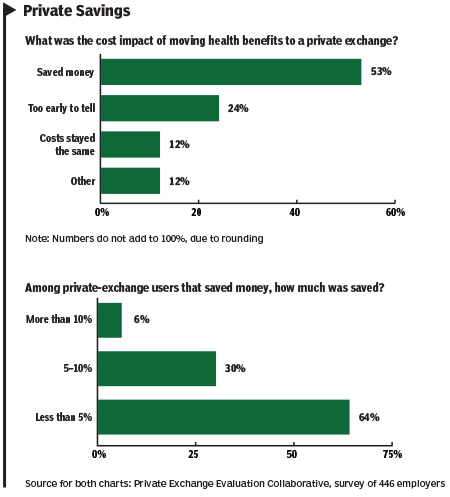 Among employers that have implemented a private exchange, 53% said they’ve realized savings (see chart at the bottom of this story). None said the move cost them money. How much a company could save depends heavily on how its benefits were structured before the move. For example, those that required employees to pay a relatively high portion of a health plan’s overall costs might see more employees opting for a low-cost plan through the exchange, creating savings for the company and employees alike. Additional savings may materialize in the area of plan management, depending on how much administrative support the private exchange provides. Also, companies that move to a private exchange often switch at the same time to a defined contribution model for funding their portion of health costs, giving employees a fixed sum per year with which to buy insurance through the exchange. That is thought to generate savings because the company can limit its cost increases in the second year of using the exchange by raising its funding for the plan in accordance with, say, the Consumer Price Index instead of medical-cost inflation. Most early adopters of private exchanges several years ago were small companies, and even now large ones tend to be conservative about making the move. But Gniewek says there’s something of a sweet spot in the present market for companies with between 500 and 5,000 employees. With so many seeming advantages, why have so few employers opted for a private exchange so far? For one thing, paternalistic companies tend to regard sending employees to an exchange to make benefits purchase decisions on their own as a cold approach. Perhaps of greater importance is a reluctance to give up control of plan design: 83% of employers said it would be important for them to retain such control when moving to a private exchange. However, many exchanges don’t offer that flexibility. The employer is presented a menu of health plans, from which it can pick a few to offer to employees. But those plans are fixed: their designs generally can’t be tinkered with, except occasionally in the case of a mammoth employer, says Gniewek. There may be change in the air, she adds, as some of the exchanges coming online from brokers and carriers may offer greater design flexibility. Despite the apparent flattening of employer interest in private exchanges, there’s a potential wild-card factor: the snowball syndrome. That is, 57% of survey respondents said that if an industry peer moved to a private exchange, they’d be more likely to do so as well.